Maybe yes, maybe no. Let's start by making sure you have all the necessary information. A standard SMS text message is delivered over the same voice networks used for phone calls. Back in the bad old days, carriers charged by the message (often 10 to 25 cents per!). Then they bundled a fixed number of messages into your calling plan, and now most of them offer unlimited messaging. In the interim, Apple unveiled iMessage, which looks and acts like standard SMS but actually relies on data networks (cellular or Wi-Fi, whatever you're connected to). That affords two benefits: freedom from carrier rates for SMS (if you're paying extra for it or have a capped plan) and a wider set of messaging features. Indeed, iMessage allows you to do things standard SMS can't, like share your location, send walkie-talkie-style voice messages, check message delivery and even see if someone's in the process of writing you back (indicated by those three little dots that appear below your last message). Ah, but here's the rub: You can only use iMessage with other iDevice owners. If you have an iPhone and you use the Messages app to contact an Android, BlackBerry or Windows Phone user, iOS recognizes there's no iMessage at the other end and switches (downshifts?) into SMS mode. Your indication that has happened? Green word bubbles instead of blue. iMessage isn't activated on the recipient's device. There's no data network available. If your phone can still connect to a voice tower, it will default back to SMS. So, is there any reason you should disable iMessage and rely exclusively on SMS? Only if data is at a premium: Although text messages are very small, picture and video messages can consume a fair bit of data -- and if your service plan offers unlimited texting but limited data, you may prefer to switch off iMessage in favor of SMS. On the flip side, if you're corresponding with fellow iPhone users but still seeing only green messages, ask them to enable iMessage at their end so you can enjoy the various benefits of the service. 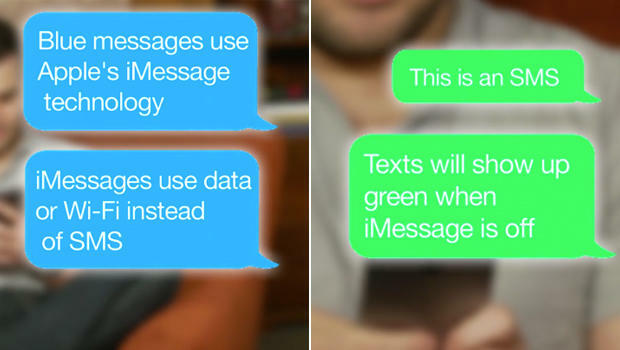 Many users have no idea iMessage is even a thing, and don't realize it's not enabled. Editors' note: This article was originally published on Feb. 24, 2015, and has since been updated. This article originally appeared on CNET.